My first two altered book junk journals. The one on the left is for my oldest daughter, who loves primitive country type stuff. For her book, Ann Coulter’s Godless, was transformed into a lovely autumn journal. 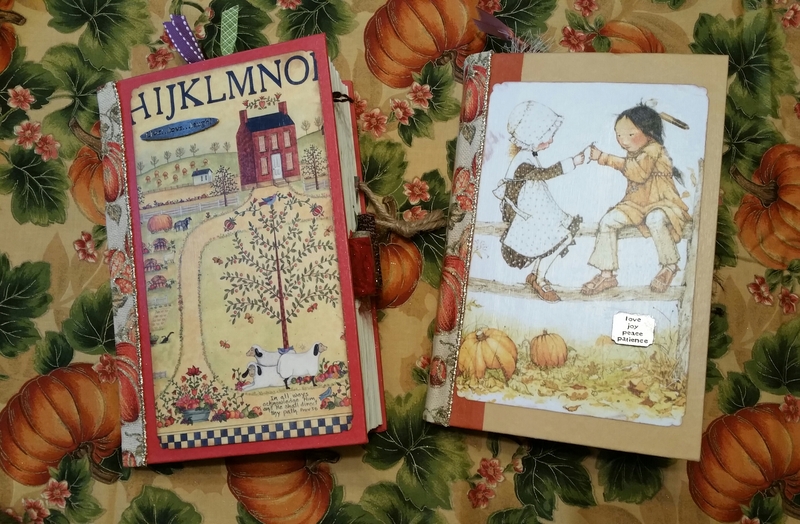 The book on the right was an “alterable book” I purchased at a craft store long ago. The covers are very simple – more old calendar pictures cut-up and glued on with Mod Podge. The spines are covered with old Walmart clearance ribbon. The little metal word pieces have been in my scrapbooking supplies for many years. The sampler image, on the left, is from The Lang Country Sampler 2009 calendar, artwork by Ellen Stouffer. The image on right is from my 2006 Holly Hobbie calendar. In the early 2000s, I purchased several books on how to make altered books, but the altered book projects looked more like art journals, way beyond my very basic crafting skill level, and although well-written, with clear step-by-step instructions, I didn’t have the confidence to attempt making one. In 2017, after watching many hours of YouTube “junk journal” videos, I decided to try making some myself. Thinking about “altered books” as making “junk journals” from old “junk” removed a mental block for me. The words we use can completely change how we, not only perceive the world, but they can also “alter” reality. In many previous posts, I’ve written about America’s raging war of words (here, here, here, here). Writing and literacy are generally seen as forces for good. It hardly needs saying that a person who can read and write has greater opportunities for fulfillment than one who is illiterate. But there is also a dark side to the spread of writing that is present throughout its history, if somewhat less obvious. Writing has been used to tell lies as well as truth, to bamboozle and exploit as well as to educate, to make minds lazy as well as to stretch them. “Greenberg saw Slick Willie as a waffler, a zigzagger, a master of obfuscation — the unworthy alter-ego of Clinton, the compassionate idealist. Greenberg concluded that, like Faubus, Clinton had presented a facade of making great progress during his first term when he had retreated on his basic promises. He talked about preserving the environment, for instance, but appeased the chicken industry. Slick Willie became a recurring character for Greenberg. All other Clinton monikers — “Kid Clinton,” “Boy Governor,” “Young Smoothie” — were retired. Bill Clinton is a brilliant politician, who masterfully uses words and has a rare gift for sophisticated obfuscation. Donald J. Trump is the king of conflating issues His use of words is the polar opposite of Bill Clinton’s brand of “slick”. Trump uses simplistic “branding” phrases, often divorced from the rest of the sentences he utters. The sentences don’t matter in Trump’s dumbed-down, branding type of information warfare. Trump transformed the Clinton spin information warfare, that relied on carefully worded, focus-group tested talking points, repeated by a vast army of colluding journalists and political operatives, into rapid-fire, Army of One, Trump-driven 140-character, daily information warfare guerilla attacks. He’s using guerilla warfare tactics in an information war. Trump word salad attacks break all the rules. He strikes with bold-faced lies and never looks back. Trump doesn’t even bother to obfuscate. He boldly lies, then insists all those around him repeat and back his lies, no matter how outrageous the lie. He has perfected the art of conflating issues into being all about “Make America Great Again”. Trump seized on the issue of NFL players kneeling during the national anthem in protest over racial injustice and conflated it into disrespecting the U.S. military. He creates endless reality TV conflicts, casting himself as the champion of American patriotism, who is the constantly maligned victim of the dastardly “fake news”. He wants to keep his supporters agitated and angry, while he wraps himself in the American flag and MAGA sound bites. Yesterday, in his effort to deflect from a reporter questioning why he hasn’t called the families of recently fallen soldiers, Trump bold-faced lied about President Obama and other presidents, claiming they didn’t call fallen soldiers’ families. General Dempsey, who has tried to stay out of the 2016 information war, took to Twitter last night to counter Trump’s LIE. Our Thoth, God of 140-characters, manages to manipulate millions, mostly poor white people, by playing to their insecurities, their prejudices and most of all their anger. At every Trump outrage they cringe, but then they fortify themselves by talking amongst themselves about how the Left is worse, but Gorsuch, and turn up the volume of FOX News blaring about how Trump is “making America great again”. And of course, the Left leads only to American demise… Trump is the last best hope in their view. Flight 93 had some real heroes on board; the Trump propaganda train jumped the tracks into tin pot dictator level, Dear Leader, bowing and scraping. Over the weekend, I walked into the room where my husband was watching FOX News, like always. Jerry Falwell, Jr. was blathering on about how President Trump will likely go down in history as a great president, as great as President Lincoln. The FOX sycophantic hosts are as dutiful as the Pink Lady in North Korea. They smiled, heads nodding, and agreed with Falwell.